"I don't want to hurt anyone, Skylar," Ruby said. She sat down at the desk and leaned back. "And I'm certainly not a killer. But Hera says I am supposed to save this city. Maybe even save the world. I met a man today who says the same thing, and he thinks the only way to do it is..." She sighed and stared at the floor. "Well, nevermind." Skylar seemed mollified. She flew up and hovered before Ruby's face. The Fixie gave a cheesy grin and pointed at her smile. "Thanks, Sky, but I'm not feeling so cheerful right now." Someone knocked on Ruby's door. She turned in time to see one of the serving girls easing the door open. Ruby turned back to Skylar, but Skylar had disappeared. Ruby stood and turned back. "Yes?" The girl carried a tray of food—a bowl of fruit, some bread and cheese, more than enough for three people. She placed the tray on the desk, stealing glances at Ruby as she did. "Lu-unch" she announced, a formal proclamation in a language she didn't understand. The girl bowed, then called towards the door. "Kariel." 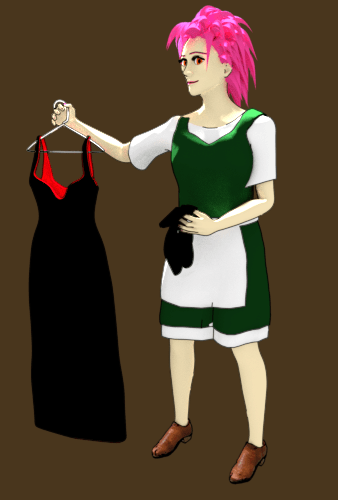 The other serving girl entered, holding up a slim black dress on a hanger, a pair of shoes in her other hand. She bowed at the door, then moved to the changing room. She kept her eyes on Ruby and collided with the doorframe. "What's that for?" Ruby asked. The first girl answered. "For..." She frowned and glanced at her hand. Ruby spotted runes written there in what looked like a Sharpie scrawl. "For dinnarr," she said. Both girls withdrew. Ruby was left with a huge plate of food and no appetite. She popped a grape into her mouth and stared out the window. "So, what am I supposed to do before dinner? And what am I going to do when I get there?" She tapped on the tray. Skylar flew out from where she hid behind the curtain and landed beside the food. "Why did you hide?" Ruby asked. Skylar frowned. She tapped her chin. "You can't tell me? Why can't you talk?" Skylar walked across the desk to the Fixie Terms and Conditions document. She pointed at a paragraph. Ruby leaned over and squinted at it. All Generation-4 GenCorp FRB models come with full AI capabilities. However, each series is bundled with a specific set of communication capabilities. To upgrade an FRB, contact GenCorp to purchase unlock codes that can be used to enhance the user experience. "So, you've got a voice, but you can't use it," Ruby said, frowning up at Skylar. "You're a Series 300?" "So I have to guess at why you act the way you do. Why did you hide?" Skylar frowned again, then pointed at the pile of surveillance scorpions on the bed. Skylar nodded. Then she pointed at herself. "And they'd see you too. Why don't you want them to see you?" Skylar pointed at herself, then pointed out the window. Then shook her head. "Okay, I don't get that one." 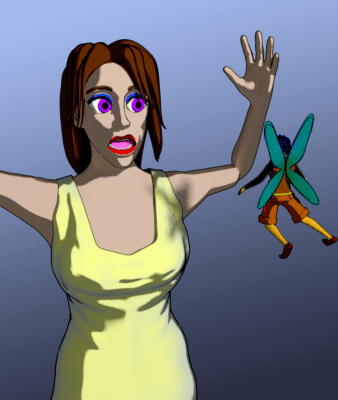 Skylar pointed at the windows, then made a flying gesture, then pointed at herself again and shook her head. "Yeah. Let me think. Is it because there... there are no other Fixie's in this city." Skylar's face lit up. She nodded. "You would have expected more Fixies in a place like this. Instead, the only robots are the surveillance scorpions. So you think you'd better keep a low profile?" Skylar shrugged. She waggled her hand in a "kind-of" gesture. Ruby took a slice of bread, broke off a piece and ate it. "Skylar, I wish you could talk. I don't suppose you could cheat and act like a Series 400. I mean, there probably isn't even a GenCorp left in this world." "That's a shame, because I need some advice right now. There isn't a single person in this whole city who..."
She thought a moment, then turned to the Fixie. "Skylar, would you help me sneak into the dungeon?" The cloak provided by the mysterious Elric was gray with sleeves long enough to hide Ruby's hands. Ruby pulled it over her head and sized it up. "I don't see how this will help." Skylar squinted and held up her hands as if Ruby hurt her eyes. "Is this hard for you to look at?" "Huh. Will you be able to see me when we're sneaking through the palace." Skylar waggled her hand again. "Well, I can see it fine, so it might fool the scorpion bots, but it will not hide me from people." Skylar pointed at her own chest, then flexed her arms. "You'll keep me safe. Good." There was no one in the hallway outside. Skylar flew up high towards the ceiling and hung there. "What are you doing way up there?" Ruby whispered. Skylar zipped across the hall, yanked a scorpion bot out from behind a gaslight and dropped it on the marble floor where it smashed into three tiny pieces. Ruby nodded. The bots weren't looking at the ceiling. Skylar zipped up the hallway one way, then down the other. She zipped in and out of alcoves and behind statues and vases along the way. Ruby couldn't follow her movement. Then Skylar appeared back over Ruby and waved for her to follow. Ruby tiptoed along the hallway. She'd only gone about twenty feet when Skylar flew back to her and made an urgent "hurry" gesture. Ruby ran. Behind her, she heard footsteps clacking on the marble floor. 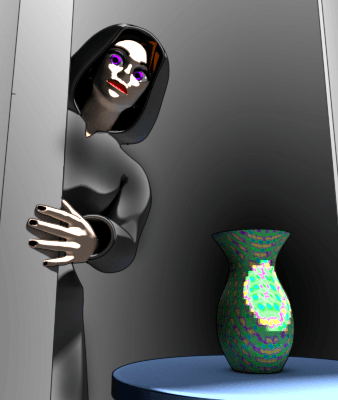 Skylar arced into an alcove to the left where a vase stood on a pedestal. Ruby spun in and crouched behind the vase. A few seconds later, three soldiers marched by in gold armor. Ruby and Skylar continued this way through the palace, dodging servants and soldiers until they reached a series of stairways. She had to crouch in a closet for several minutes until Skylar returned to signal the all-clear. Ruby rushed down three flights of stairs, the first two being polished marble, the last was narrower and shadowy, carved from granite. At the bottom, she found herself in a maze of narrow corridors lit by dim gas lights. Skylar flew down one passage, then zipped back the other way. As she searched, Ruby crouched in the dusty shadows under the stairs. Skylar returned looking pleased. She waved for Ruby to follow, then shot to the left. Ruby rushed after her. They took several bends in the stone hallways. Skylar disappeared around a corner, then rushed back and gestured for Ruby to hide. There was nowhere to go. Footsteps grew closer, echoing in the stone passages. She wouldn't have time to get back to the next bend before whoever approached was there. She leaned back in a shadowy doorway and held her breath. The footsteps approached then faded. Whoever it was, they hadn't taken Ruby's passage. If they had, they would have found her for sure. Skylar returned and waved for her to continue. "They're going to catch me down here," Ruby whispered. Skylar shook her head and waved for her to follow. Around the next bend, Ruby found a much wider room. It was a large semi-circular space that grew deeper the further it extended away. This appeared to have once been an auditorium, but the benches had been removed and cinderblock rooms with barred doors lined the walls. Soldiers stood at one end, spaced at regular intervals, guarding a few cells. The rest of the cell doors were open and unguarded. At first, Ruby thought this might be the prison where they kept all the people kidnaped by dragon riders. But no, Hera had described hundreds of people taken, and there couldn't be more than half a dozen people locked up down here. Montrose was in one of those cells. "I don't see how we can get to her," Ruby whispered. Skylar hovered beside her, her tiny hand on her chin as if considering the challenge. As they remained there, more footsteps approached from down the hallway in which Ruby stood. She searched for a place to hide. For her to evade whoever was approaching, she'd have to step out in full view of the soldiers in the amphitheater dungeon. She tried the nearest door in the corridor. It was locked. "Skylar," she whispered. 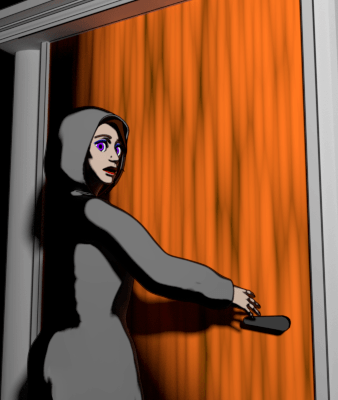 Skylar shot down, shoved her hand in the keyhole and fished around inside. A moment later, the lock clicked. As she withdrew, Ruby turned the knob and slipped into the darkness. She closed the door just as the footsteps reached the hallway outside. She leaned on the door and waited. "Pardon me young lady," said a man's voice from the darkness. "Might I borrow a little of your spark?"